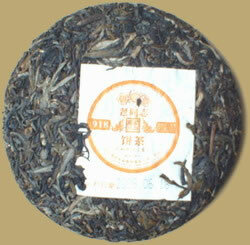 One of the Haiwan's "99" series Pu-erh. This excellent raw cake consists of the highest grade tea leaves from where was certified ecological tea garden by China Green Food Development Center, prepared with great care by Mr. Zhou Bing Liang, the prestigious Pu-erh tea expert who is in charge of the complete tea processing methods to guarantee a premium quality. Great potential after a few years of aging.